This time last year I was cast in a Weather Channel documentary on The Donner Party, filming right here in Northern Nevada where the ordeal took place. It was an interesting process - on a whim a group of us Great Basin Costume Society gals went to the cattle casting call and stood outside for hours waiting to have a mugshot headshot taken. Some weeks later a couple of us were called back and told we were on the short list for certain characters. I was up for Margaret Reed, and tried really hard to learn my lines and be all natural and stuff, but when the time came to read for the part I was absolute crap. Like whoa, crap. Needless to say, I was not cast in that part. This is what I wore to my callback reading, but it wasn't enough to save my terrible terrible lines! 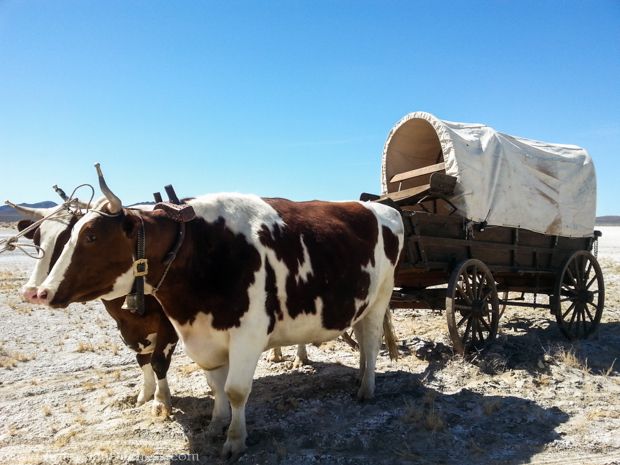 I was, however, cast as the illustrious Wagon Train Woman #2. The day came for costume fitting and I died a little inside. 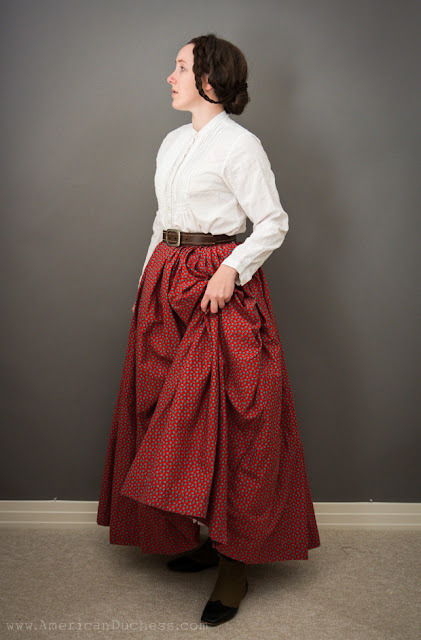 As Wagon Train Woman (#2), I wasn't expecting nice clothes, so I quietly wore what they gave me, but couldn't fit the shoes. Thankfully they let me wear my own. So I wore Gettysburgs, and was proud to have the most authentic piece of costume on the entire production. Except for the poor local re-enactor guy who wore his own gear...but we'll talk more about him later. Filming was both hectic and boring. I was "on call" for two days, not knowing if I had to be somewhere the next morning until 11 pm the night before. The call times were super early, too, in locations about an hour and a half away. Once there, everyone dressed out of the back of a moving van, and then the waiting began. Those who had been on this sort of thing before were well-equipped with magazines and games, but noobs like me...well, we just sat around eating snacks for hours. There was a certain camaraderie that developed among us extras very quickly, though, which made it rather fun. Wagon Train Woman #1 and I became fast friends. 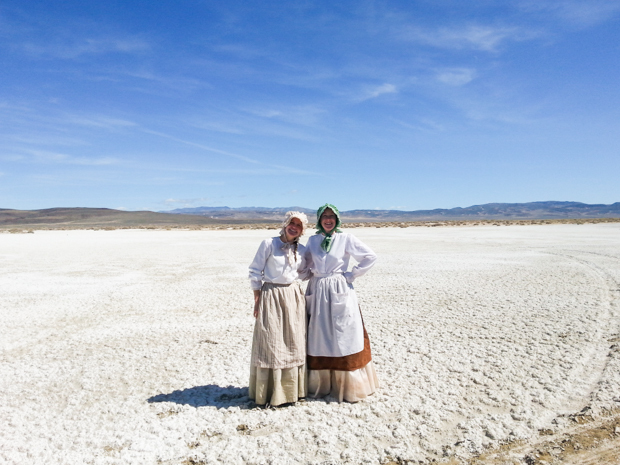 Wagon Train Women #1 and #2 "on set" in the dry alkaline lake bed - Day 1. It was early in the day; we were still smiling. The "set" was quite stunning, once we were called to perform. 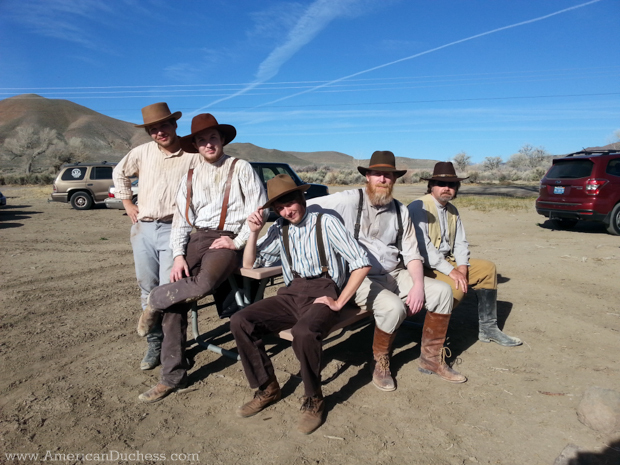 For this part of the journey, we the Donners, et al, were to cross a dry alkaline lake bed, attending three covered wagons pulled by the most enormous oxen. 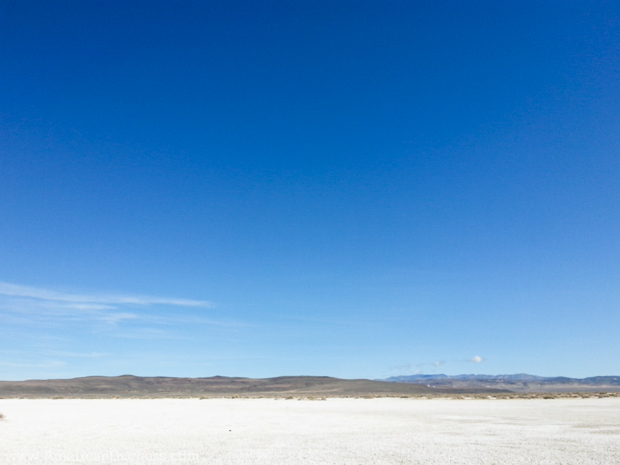 The production crew asked us all to walk across the lakebed for about a quarter mile and they'd film on the ground and also with a drone in the air. Easy, right? The oxen were enormous and moo'd a lot. They were wrangled by Portuguese ranchers. Wrong. We spent hours walking at a snail's pace across this piece of land. The oxen moved incredibly slowly. We ambled. If the Donner Party really did walk that slowly across the country, no wonder they got stuck in the early winter snows. It was hot, slow, endless drudgery, complete with sunburn both real and fake, and makeup artists spraying glycerin in everyone's faces throughout the day. At the very end, the crew created a mud pit for us all to slop through, so add four pounds of alkaline mud onto your feet, along with the real dirt, fake dirt, real sweat, and fake sweat, and it was dirty, dirty work. I had thought earlier how nice it would have been to wear my own costume and be authentic, but by the end of that first day, covered in grime and with our clothes being roughed up by the costume crew, I was so happy I hadn't worn my own stuff. The other reenactor looked none too pleased at the state his carefully-compiled kit was now in. There's patina...and then there's Donner-destructo. Guess who wasn't happy about his clothes being Donnerated? But you know what did just fine? My shoes. 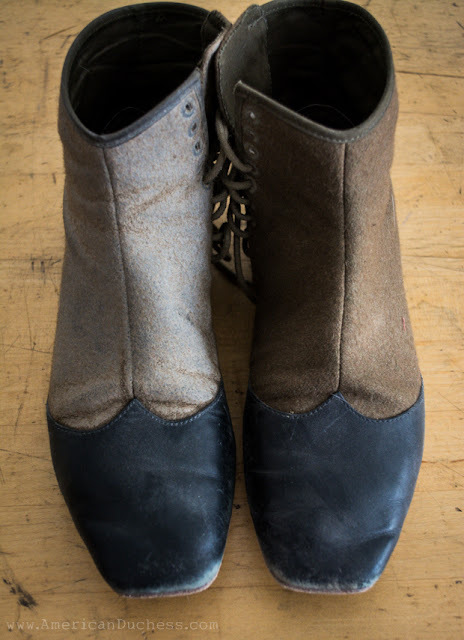 On my feet for 16 hours walking across rocks, dirt, salt, and mud, and my feet didn't hurt and my Gettysburgs were holding together like fierce 1840s warrior booties. They looked terrible, but I had zero problems with them. I can't think of a more thorough test than Donnering for two days in the desert. After The Ordeal - on the left is the waxed Gettysburg boot, which retained plenty of white salty playa. I washed, waxed, and oiled these after it was all over and they look great. Soles are still on and in tact. They look rather like originals now. 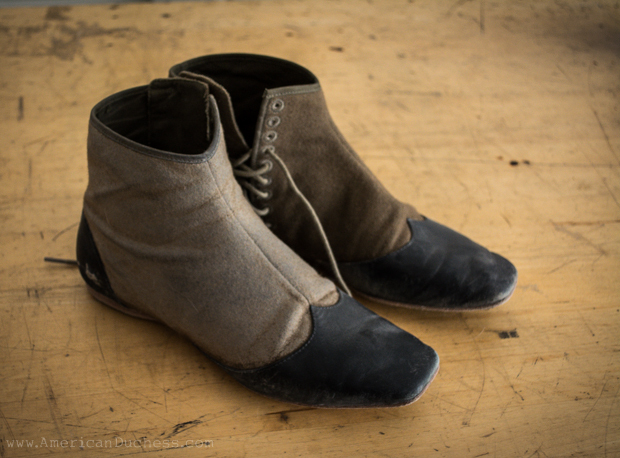 1840s Warrior Boots. They carried me through the desert faithfully. Talk about a test! I got home at 9:30 pm. I haven't been that tired in years, and at that moment I swore I would never underestimate the work and effort actors put in to any kind of film production. The principle actors had been on set all day and all evening, doing the same scenes over and over again. They had it so much worse than us extras, and I will never...ever...think an actor's job is a cushy one. 11:30 pm and there's the call time in my email for Day 2...be on location at 7:00 am. I seriously had thoughts about ignoring it, but I signed up for this and where would they be without Wagon Train Woman #2? I couldn't let the team down, my suffering brethren on film, so I set my alarm for 4:30 am. What will become of Wagon Train Woman #2? Haha, it was....both good and bad. It was definitely "an experience" ! My kids and I were extras on a modern day indie film last year. Poor kids lol. My little one just about lost her love of hula hooping. And blowing bubbles will never be the same! We didn't even get glorious names. It's fun to see 'behind the scenes' though. Poor things! I know *exactly* how they feel! I FEEL YOUR PAIN! I was a photo double for a major actress, in a scene where I had to lie around in the wet grass of a graveyard. Luckily it was summer, but it was in a hill where there was WIND in that wet grass. All night. I've seen the movie and you can't tell WHO it was in that scene -- it could've been an old sack of garbage decked out in that costume! My first thought when you talked about alkaline dried lake bed was WHAT ABOUT THE SHOES????? OMG??? I guess you are some kind of footwear genius! Bwahaha! Isn't that how it goes? Ironically I have yet to see the final film that resulted from this adventure, but I hear that Wagon Train Woman #2 didn't appear anywhere in it. I'm sure I could pick my sorry staggering form out in some of the distance shots if I ever get a chance to see it! Yes, as soon as they dumped the barrels of water in the lakebed and asked us to trudge through it I thought for sure that was it for my shoes. I was *amazed* that they survived. There is some salt in the leather still, but Angelus makes a de-salter product just for this purpose. Wait.... Oh I can just see the Angelus ad: has the luster gone off your dainty dancing shoes from too much clogging thru a muddy field? I was interested, tho, about the waxing. When you wax the fabric, I assume it helps with keeping out the wet. Does the wax flake off with wear and have to be reapplied? How do you apply it? And I assume you did one to test how it worked. It did darken the wool, right? Lol, I am enjoying your adventure! It really is not such a glamorous job as it seems, to work in the film industry. Thanks for sharing your experiences. I really enjoyed see the video--it helped show the scale of oxen. They are super large!!! Did they film this out at the alkaline flats near Silver Springs? That stuff is nasty. I get the part about the dirt and mud being caked on... i used to live on a property that had a ton of the stuff. I have never done film, but plenty of stage acting. Sounds interesting. I'm not surprised your shoes/feet held up - whatever lasts you're using, they're good! Awesome that the shoes performed so well! I learned how hard acting/film making is when my husband helped with a fan film. Talk about crazy time investment - and he was just a prop maker and extra! For the others who were more involved it was definitely even MORE work!